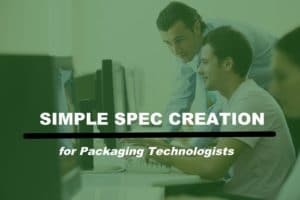 Specright’s Specification Data Management solution makes it easy for packaging engineers and technologists to streamline packaging specification creation. With Specright, users can quickly and efficiently search, find or create new specifications from scratch or from existing specs, all while keeping key stakeholders in sync. Our solution saves packaging engineers valuable time wasted on unnecessary work. This enables them to transition from a reactive service provider to a proactive business partner. Easy spec creation: Creating new specs are fast with our Like Item Finder and pre-built packaging commodity templates. Identify already existing similar items by packaging type, style, and dimensions Get full revision control and intelligent reporting on important issues such as material reduction, quality and SKU consolidation. Keep downstream stakeholders in sync: Efficiently collaborate on new package development, artwork, and revisions, all while keeping stakeholders (regulatory, marketing, print houses, suppliers, etc.) in sync. Reporting and activity reports keep everyone accountable and lean out process timelines. Fast specification creation: Bulk up-load your specifications from any CSV file. Create new specs from 1-click cloning. Use Specright’s engineering services team to upload specs from any format or system into Specright. Have access to prebuilt and custom created templates. To find more ways how Specright makes it easy for companies to get control over their packaging specs enabling them to streamline operations and ultimately reduces costs, read more here. Rebecca Janzon is Marketing Manager for Specright. She has 20+ years of experience in the areas of marketing, communications, PR working in marketing roles at SKF, Atlas Copco, Nobel Biocare, and Cochlear. She brings a wealth of knowledge in SaaS, engineering services, computer software, and packaging.